Author(s): Feng Guo, Suojiang Zhang, Jianji Wang, Botao Teng, Tengyan Zhang, Maohong Fan. Department of Chemical and Petroleum Engineering, University of Wyoming, Laramie, WY 82071, USA. Ionic liquids (ILS) are typically referred to as “green” or “designer” solvents. These solvents consist entirely of ionic species exhibiting many fascinating properties, such as non-flammability, low vapour pressure, wide electrochemical window and thermodynamic kinetic stability. Moreover, these remarkable properties can also be adjusted by using various synthesis methods. The application of ILs solves many major problems in green energy production and environment including solar energy, biomass and CO2 adsorption. Although, given our current state of knowledge, the applications of ILs are unpredictable; they have nonetheless rapidly attracted enormous attention in the fields of modern physical chemistry, materials science, applied technologies and engineering. This review focuses on the basic ILs synthesis methods and the latest advancements in the clean energy and environmental application of ILs. Keywords: Application to energy, application to environment, ionic liquids, synthesis. Affiliation:Department of Chemical and Petroleum Engineering, University of Wyoming, Laramie, WY 82071, USA. 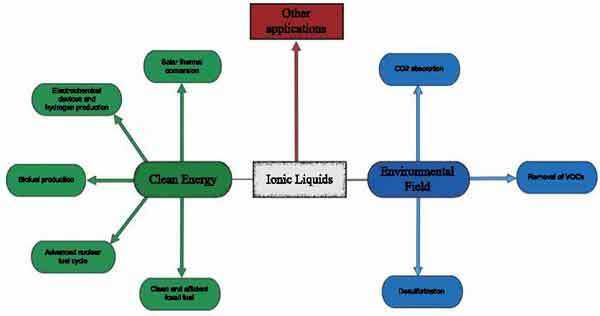 Keywords:Application to energy, application to environment, ionic liquids, synthesis. Abstract:Ionic liquids (ILS) are typically referred to as “green” or “designer” solvents. These solvents consist entirely of ionic species exhibiting many fascinating properties, such as non-flammability, low vapour pressure, wide electrochemical window and thermodynamic kinetic stability. Moreover, these remarkable properties can also be adjusted by using various synthesis methods. The application of ILs solves many major problems in green energy production and environment including solar energy, biomass and CO2 adsorption. Although, given our current state of knowledge, the applications of ILs are unpredictable; they have nonetheless rapidly attracted enormous attention in the fields of modern physical chemistry, materials science, applied technologies and engineering. This review focuses on the basic ILs synthesis methods and the latest advancements in the clean energy and environmental application of ILs.